Saving money is earning money. To save it, you should know, where you spend it. The personal finance management software will help you to keep track of your daily expenses and income. Smartphone help you to enter every transaction on the spot and you don't have to wait to start your PC. The Money Manager EX is cross platform, completely free and very easy to use application available for Windows, Android, Mac OS and Linux. All the feature are available in free version and there is no any locked feature or trial period. Multiple accounts, all currencies, multiple databases management, easy to use interface and easily manageable expense and income categories make your money management a breeze. 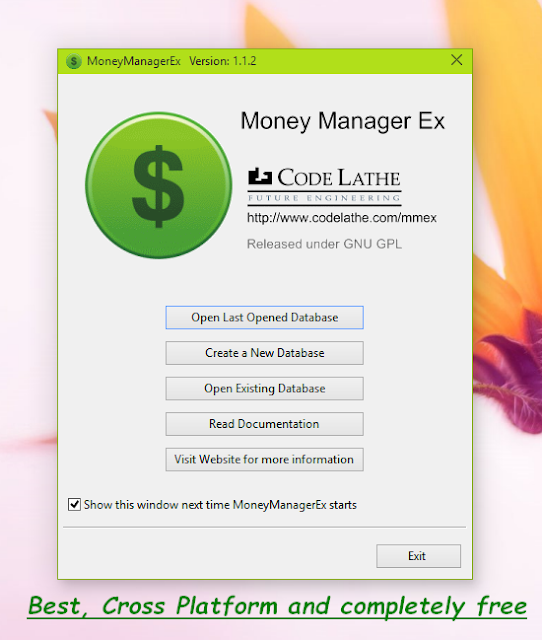 ‘Money Manager Ex’ saves all your data of the transaction in a separate and portable database file that can be easily copied and placed on your pen drive. When you launch the ‘Money Manager Ex’ first time, it asks you for the location to save the database and you have to give a name to it. Once you have created a new database for your personal finance management, a new database wizard will launch which guide you to setup the basic requirement of financial operation. Here you have to select the base currency of your account. If your currency is not included in the list you can add a new currency. Click on ‘add’ button and give a name to your currency. Once you give a name to your currency it will launch ‘Currency Manager’ where you have to define the name, symbol, unit name, cent name and other feature of the currency that will help you to easily read the transaction. This is again a simple step to add the required details of your financial transactions. The add account wizard will help you to set up your bank details like the name of the account, name of bank, other details of bank, type of account like saving, investment or term. Again the new account window will ask you for extra information about the bank account which you can fill if you want. Here you have to fill the initial balance in the account. This will help you to keep track of the balance of money. Once the wizards get the data it create a summary page will be displayed automatically or if you click on ‘Home Page’ button in the left pane. The summary page will have information about the top withdrawals, balance in the account and income vs expenses comparative chart. You can add as many accounts as you want like a saving account with bank 1 and bank 2, then a fixed deposit account, an investment account. The transaction catalog will be maintained separately with every account and you can easily track and manage these accounts separately. To add a new transaction to any of the bank account, first select the account from left pane and click on ‘New’ button at the bottom. This will open a transaction window where you have to enter the details of the transaction. You have to enter the date, amount, type of transaction like withdrawal, transfer or deposit. Also select the payee. You have to manually enter the name of the payee. The list can be edited and reusable. Once you create a list you can use it for all transactions across all the bank accounts. Same is the case with expense categories. Though there is a predefined list of expenses, you can add more categories as per your convenience. Enter the referring check number and also note about the transaction. The expenses and income categories are in the same list. You have to select the appropriate category to give exact information. You can manage an unlimited number of accounts and save them all in one single database file. You can manage your stock portfolio by adding investment account. You can also add information about all your assets like vehicle, house, jewelry cash and their value. To add the information click on Asset and then on new. This is also a useful feature that can help you to remember and manage the repeating transactions like taxes, electricity bill, bank loan installments and like that which keep repeating at fixed interval of time. This will remind you about the event and help you to manage your budget. This is really a useful feature. You can manage your monthly or yearly budget. Just right click on the budget setup link on the left pane. It will open a small window, select the time period of the budget and click OK. The budget editor is in front of you. You just have to add the known expenses and the income sources. It will give you the detailed analysis of your personal finance. You can easily manage your money with the help of this free personal finance software. Start budgeting the money and start saving. You can import or export the transaction in csv format for other uses. ‘Money Manager Ex’ runs on all versions of Windows, Linux and Mac OSX.